Student panelists with President Stroble: Follow the MyWebsterU Instagram account for scenes this week from GLA fellows. The 2016 cohort of the Global Leadership Academy arrived in Greece for a week of leadership and professional development sessions at Webster's Athens campus. Following arrivals throughout the weekend, the GLA fellows had breakfast together Sunday before visiting the Acropolis, then enjoying "Leadership Lessons from Ancient Greece," an afternoon session with Susie Michailidis and Tom Mazarakis of the Athens campus. For lunch on Monday they were joined at small tables by students for conversation and insights into their experience at Webster. 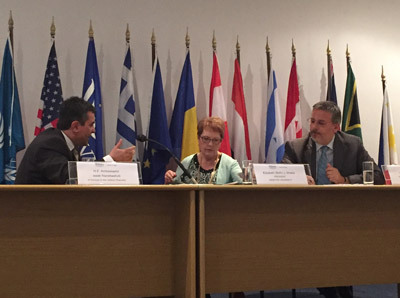 On Monday afternoon they were joined by President Elizabeth (Beth) J. Stroble and ambassadors Ioseb Nanobashvili of Georgia and Lucian Fatu of Romania for the global leadership symposium, "Transformation through Collaboration." Discussion ranged from security versus privacy, the shooting in Orlando, the future of the European Union, challenges facing higher education, and the importance of the relationship between Greece and Georgia. Responding to a question about challenges facing higher education, Stroble was hopeful, saying "The human connections help us see the way forward." That connections are often enabled by the work of a global university. "Institutions like Webster University feed us ideas to help us solve global problems," Ambassador Nanobashivili said. Also during the symposium, Ambassador Fatu shared his approach to collaboration. He spoke about postwar Europe and the periods when it was led by values or led by interests, and how the current difficulties in the European Union stem from conflicting interests among countries. He stressed that "values do not enforce themselves. We must be prepared to do so." Tying the themes together, he noted the importance of leadership to keep the EU strong. Following a week in St. Louis in March, this is the second full week of activities together for the 2016 cohort, which also continue their collaboration online with each other throughout the year. The plan for Tuesday involves in-depth leadership and personality discussions as the fellows learn about and explore their own personality inventories and the implications for their own continued leadership development. 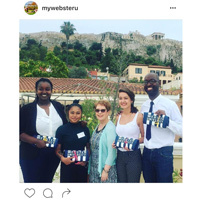 The @MyWebsterU Instagram account is being helmed this week by GLA fellow Jennifer Starkey, associate director of public relations in Global Marketing & Communications. Follow that account for more scenes from their week in Athens -- and follow it year-round for global student life coverage throughout the Webster network. The Global Leadership Academy (GLA) is a leadership development program open to the faculty and staff of the Webster University global community. GLA fellows are selected each year to participate in a series of workshop and activities that help them to lead successfully in their roles and positions within the University. Applications from faculty and staff are solicited in the fall for participation in the next cohort.